The Democratic Republic of Congo (French: République democratique du Congo), which prior to 1997 was known as "Zaire", is a country in central Africa. It shares land borders with Angola, Burundi, the Central African Republic, the Republic of Congo, Rwanda, South Sudan, Tanzania, Uganda, and Zambia, as well as having a short coastline on the Gulf of Guinea, which is part of the Atlantic Ocean. The capital and largest city in the Democratic Republic of Congo is Kinshasa, which, as of 2009, had an estimated population of 10,076,099. 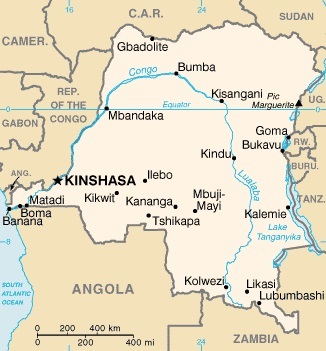 Kinshasa lies on southern bank of the Congo River. On the opposite bank is the capital of the Republic of Congo, Brazzaville, which has about 1 million inhabitants, and the two together are often considered as one large conurbation, Kinshasa-Brazzaville. Write down and keep track of all your thoughts and experiences through out your adventure with this handy notebook. Memories are worth cherishing and this book will help you relive those experiences many years later.